In 1999, UNESCO (the United Nations Educational, Scientific and Cultural Organization) declared March 21st as World Poetry Day. Designed to promote the love of poetry through reading, writing, listening and composing, World Poetry Day celebrates all types of poetry and all poets, from Shakespeare to Dr. Seuss! Explain that what you read to them was a simple poem. Ask students whether they liked the poem and why. Do they know any other poems they can share? Divide students into five groups by labeling them purple, pink, blue, red, and yellow. Invite each student to draw and colour things that represent the colour they have been given. They may use crayons, markers, paint, construction paper, words, pictures etc. Once the artwork has been completed, teach the specified line to each group. Invite all students to stand up and show their artwork as they share the line that represents their colour. Did you enjoy this activity? Why? Did you find it easy or hard to remember the words in your line? What helped you to remember your line? Invite students to bring in any books from home that contain poems. For more information about teaching poetry, check out the following here. Poetry is a genre of literature. Poems are often written in verses or stanzas. Poetry often evokes feelings or moods. Comparisons are often used in poetry. Poems often create a picture in the reader’s mind. Divide students into small groups and provide each with a large sheet of paper and a marker. Explain that today they will be invited to write a short poem that rhymes. The first step is to select a word to put in the center of the page, and then brainstorm words that rhyme with it. Suggest that students pick a simple word that would have lots of rhyming options such as an animal, a colour, an emotion, etc. After the brainstorming map has been created, invite each group to write a simple poem (one or two stanzas). They may also choose to illustrate their poem. Did you find this activity easy or difficult? Why? Do you think it is easier to write a rhyming poem or one that doesn’t rhyme? Why? Why do you think all people regardless of age enjoy poetry? Take the activity a step farther by inviting the groups to now write a simple poem that doesn’t rhyme! Poetry is written in lines. Groups of lines with breaks in between are called stanzas or verses (as opposed to sentences and paragraphs). 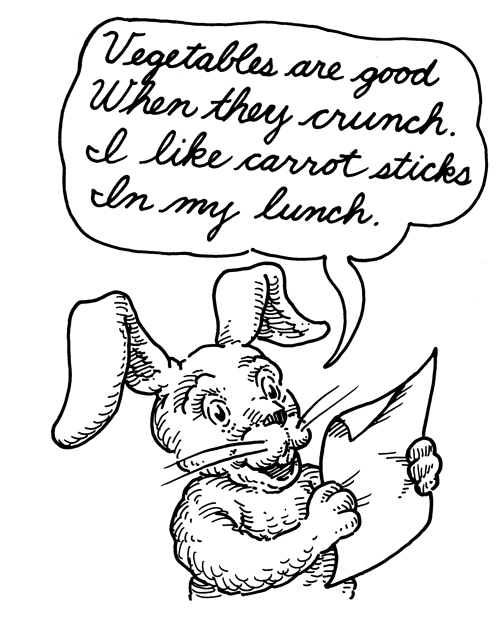 Figurative language (such as simile, metaphor, personification) is often an important element. A poem typically has a mood (humorous, sad, happy, etc.) and appeals to the reader’s emotions. Poetry and Prose: What's the Difference? Acrostic: A poem where the first letter of each line spells out a word. Shape Poem: A descriptive poem that is written in the shape of the subject. What did you like about this activity? Why do you think young and old enjoy poetry all over the world? What is the favourite poem you heard today? Why? Mar. 2nd - Dr. Seuss Day!